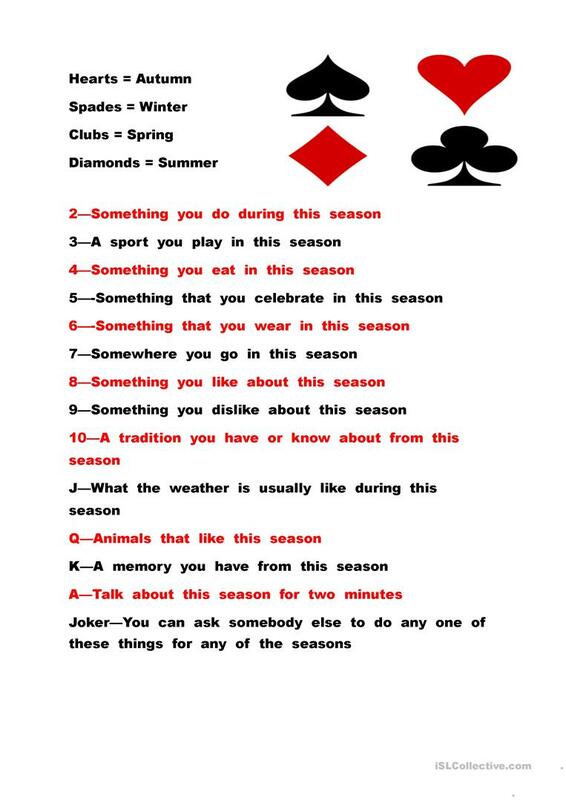 Simple game for teaching the seasons. All you need is a deck of cards and a worksheet for each student. Each student draws a card and then answers the relevant question based on suit and card number. It works well as the questions are never exactly repeated and you can therefore use as many of the cards as you like. The above downloadable printable is best suited for high school students, elementary school students and adults at Elementary (A1), Pre-intermediate (A2), Intermediate (B1) and Upper-intermediate (B2) level. It is excellent for strengthening your pupils' Speaking skills. It is focused on the theme of Seasons. Lauriesymon is from/lives in China and has been a member of iSLCollective since 2012-06-07 09:54:49. Lauriesymon last logged in on 2013-11-13 14:04:48, and has shared 1 resources on iSLCollective so far.